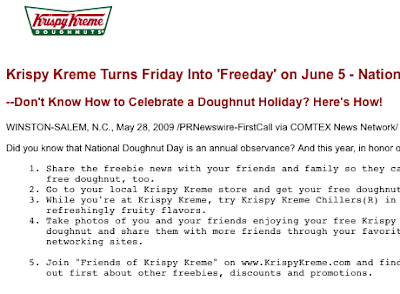 Alive and Young: FREE Donuts from Krispy Kreme! Krispy Kreme donuts are one of my favorite donuts that are out there. They have got to be some of the most unhealthy things around though. In honor of National Doughnut Day (notice the spelling of "Donut".) Your local Krispy Kreme Donught is giving away free donuts.